Beyond Easter? Or is Jesus finished? Was the resurrection the end of Christ’s work? A number of people seem to believe that is was; that he was sent for, and His work accomplished for, the Jews; that “in some way” the work benefitted the rest of the world as well; that now, He is not active or a force in the world; that because of what he did in the past, the world has been ‘set to rights’. We do have, in God’s revelation to us, the teachings of what the ascension means now. "Now, if Jesus merely wanted to return to the Father, he could have just vanished. There were other times when he vanished immediately out of sight, as with the disciples on the road to Emmaus. But instead, at the ascension Jesus literally rises up into the clouds and disappears into the distance of the heavens. Why did he do it that way? We can only speculate, but it may have been for the same reason that we have a coronation ceremony. Further, thanks to the ascension, Jesus is now engaged in his mediatorial work for his people across the globe. Thus, the ascension is a critically important doctrine, one that is not a mere abstract teaching, one that has important implications for how we live. The ascended Christ is available for loving communication and fellowship. He is supremely personal. The ascended Christ guarantees that you can know you are forgiven, accepted, and delighted in by God the Father. He is our advocate who intercedes constantly for us. As the great creed has reminded Christians across the ages, “He ascended into heaven and sits at the right hand of God, the Father almighty, from where he will return to judge the living and the dead.” Jesus went up and back into heaven, but will one day return as our conquering king. The Lord, by his ascension into heaven, has opened up the access to the heavenly kingdom, which Adam had shut. For having entered it in our flesh, as it were in our name, it follows . . . that we are in a manner seated in heavenly places, not entertaining a mere hope of heaven, but possessing it in our [covenantal] head. " I think this is just the tip of the iceberg. Jesus is the one who pours out the Holy Spirit - on believers. Which he has done every day for the last 2K years or so, and is doing today as well. Dave, This makes it sound like God never existed before Jesus came into being, and that Jesus replaced God as the sovereign King over the created order. The way I see it, Jesus was a man of God, and those who live in the same Spirit continue His work. For example, Danny Thomas established St. Jude’s in the Spirit of God. When he died, Marlo took over and continued on. This doesn’t mean that after his death, Danny suddenly became God and is now directing all of history. You are arguing with scripture, not with me. No. I am arguing with the interpretation of scripture. “God is not human.”, nor does man become God. However, humans can be " in the likeness of God." I have added a footnote here: Do you believe the Bible is infallible? If so, why? HF, Thanks. 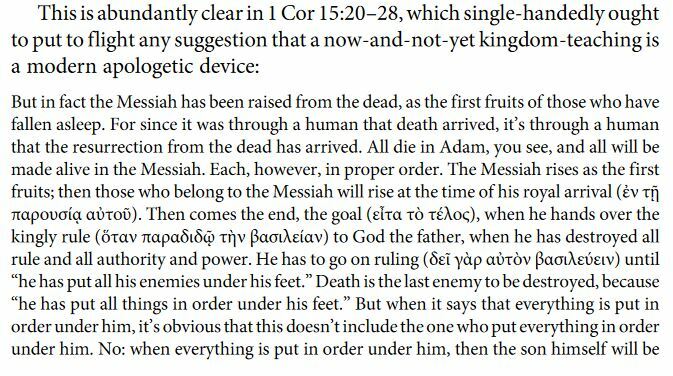 I was reading the link you provided on Theosis and I noticed a change in the some of the scriptural quotations. The word god with a little “g” became God with a capital “G”. There is a big difference between the two. The word god means a ruler, leader, teacher, etc. not God. Jesus was a great spiritual teacher, an example for us to follow, as was Abraham, Moses, Elijah, etc. People were able to communicate and have been communicating with God since the beginning of creation. The Old Testament says that Abraham was a friend of God. His change in name from Abram to Abraham also indicates a change in his person. Likewise, Jesus was transformed on the Mount and became “like Moses and Elijah” who were “like God” but not God. Here is what Paul says, as explained by Tom Wright. 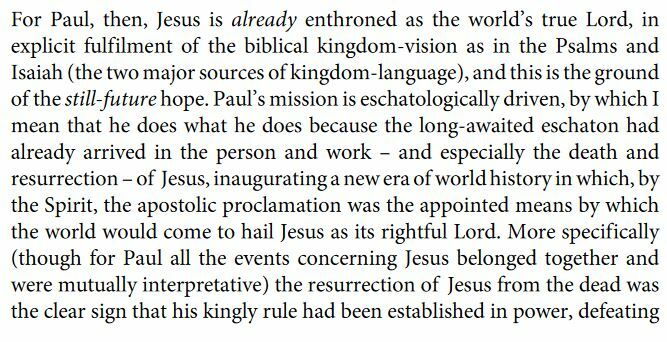 This is what I wanted to emphasize above - Christ’s work is ongoing in every century since His ascension. His involvement in the world is continuing and real. Objectively, not ‘spiritually’ or as a ‘matter of faith’. I realize that the whole ‘objective reality’ thing is hard for some. This is what I wanted to emphasize above - Christ’s work is ongoing in every century since His ascension. Dave, to me, the word Christ means God’s anointed or people who are " born of the Spirit". It does not refer to just one person. So Christ’s work has been ongoing from the beginning of creation.There are times when the kingdom of God doesn’t have that many participants, times when they are scattered and times when they are gathered. However, from the foundation of the world, such people have always existed.